Hello, everyone! I’ve been testing out the Urban Decay Ocho Loco 2 eyeliner set for about four days now, and I just wanted to share my thoughts. 🙂 This isn’t a full review by any means, but for the most part, I am enjoying this set a lot. 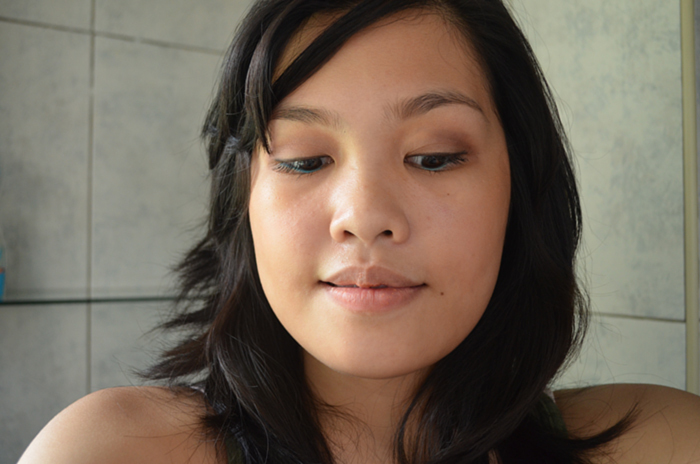 That’s saying something, because I am not a big liner girl, since I usually play with my eyeshadow instead. 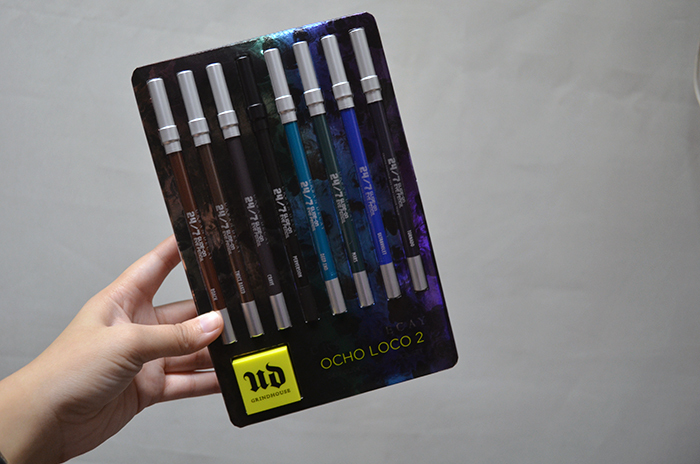 Anyway, the Urban Decay Ocho Loco 2 is one of their holiday sets for 2013. You get EIGHT 24/7 Glide-On Eye Pencils, four of which are limited edition shades. Add to that a Grindhouse sharpener, which is celebrated in its own right. I haven’t sharpened anything with that yet, so thoughts on that are on hold. But it’s a really pretty color, and I love that it has a pick thing that sort of deals with the eyeliner/product gunk build-up by near the blades. 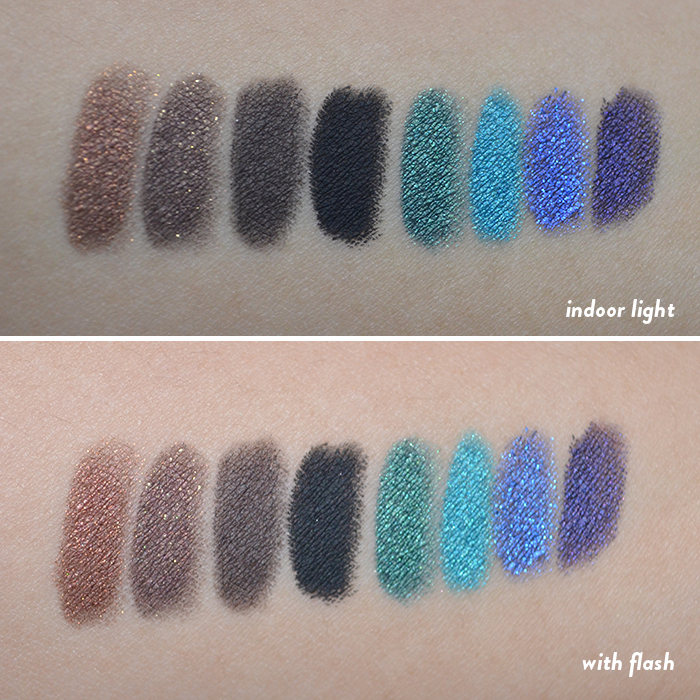 Here are the initial swatches, from L-R: Roach, Twice Baked, Crave, Perversion, Mars, Deep End, Ultraviolet, and Tornado. These glide on so well and they pretty much stay put. 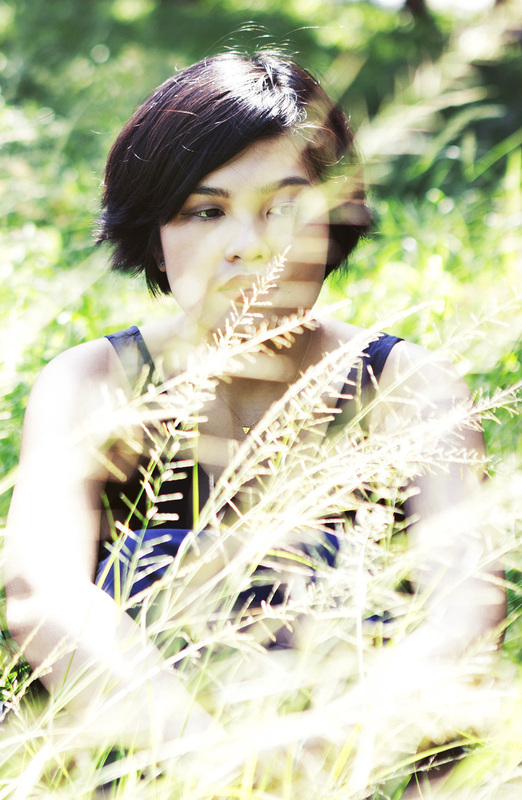 I rubbed my finger over the colors, and there was very minimal transfer, mostly just the shimmer particles. 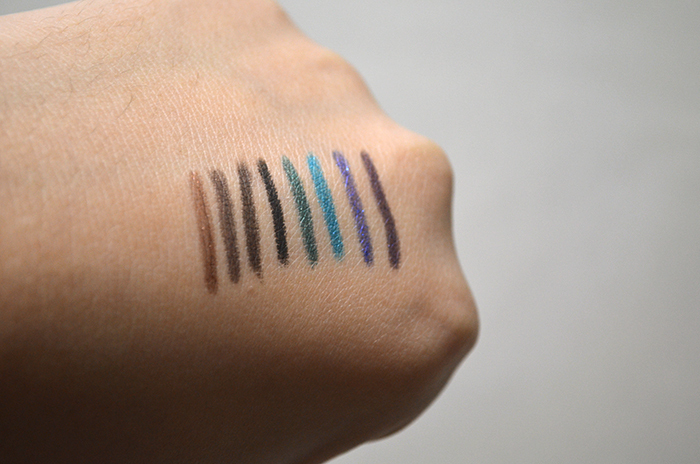 I didn’t think that these swatches really showed you the shade differences and range of the liners, so I took some more swatches that are more representative of what they really look like, i.e. supah gorgeous! Beautiful! 🙂 Roach is a coppery color with a bit of shimmer. I’m a bit sad and icked out that it does sort of resemble a cockroach, even though that’s probably not what they meant by ‘roach.’ LOL. It also does sort of look like the burnt part of a roach, but I’m guessing people will associate it more with the bug. ANYWAY. It’s beautiful. I’ll try not to think of cockroaches when I put it on. Twice Baked is a deeper, cooler brown with shimmer. Crave is a blackened brown that looks close to black. It’s deeper than most dark brown eyeliners that I’ve encountered. I think people would mistake it for a black. 🙂 Perversion needs no introduction! It’s a full-on matte black. Mars is a teal-ish blue green color. Deep End is a turquoise/aqua shade. 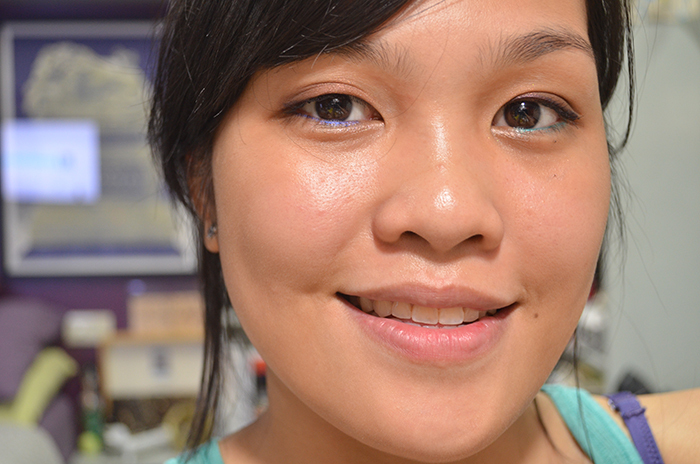 Ultraviolet is a blue violet shimmery shade that is so pretty but is also the patchiest and least opaque of them all. Tornado is predictably my kinda color. It’s a blackened purple that is also somewhat bright. I think this is a shadow from one of the Oz palettes that they turned into a liner. Also, I got bangs and a haircut! 🙂 They look yucky in the last photo because I had just rolled out of bed. Some general thoughts: I think that $20 for a liner is absurd, even though Perversion is so good that you can say ‘bye’ to all your other black pencil liners now. I talked myself into getting this set because it’s such a great value, overall. 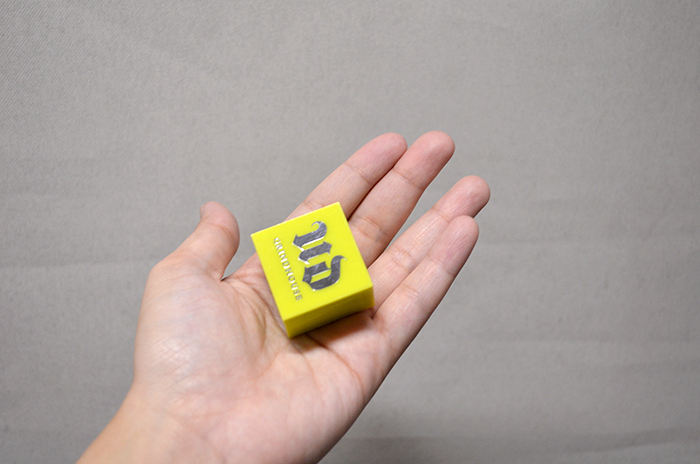 There are 8 liners—all of which I actually like—and a sharpener for slim and thick pencils. And it retails for just about a dollar under the price of three pencils—$59. I mean, seriously. Also, these liners are so good that if there is a particular color you don’t like, it’s totally acceptable to gift it to a friend. S/he will probably glomp (jump/tackle/hug) you, even. They’re ah-mah-zing, so get them when you can! I love theeem! They are pretty pricey nga per piece and that’s why I’ve never tried them haha. But I do need a good solid black eyeliner! I like the new haircut! Ahhh, these are all so beautiful. Ever since I started using gel/cream liners, I’ve developed a dislike for pencils. They’re either too hard or too creamy. I had a UD liner pencil in Bourbon (another great brown shade!) but that one was too creamy and would smush (is that the right word? LOL) very easily and eventually it started to crumble as I applied it It also seemed a lot less accurate. I like very fine lines and its hard to get that from a pencil. That being said, these are GREAT colors and they look awesome on you! I wish I wasn’t so color shy! This is a great value! And the colors are amazing. 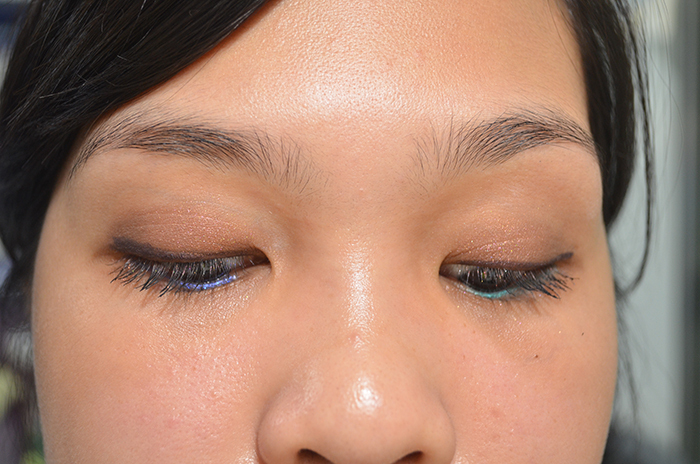 Love what you did with that blue eyeliner in the centre of the lower lid. On my to-try list!